Our estate vineyards are the heart of the winery. The world class wine for which we are known starts there, in the dust and the cobbles. Watermill currently has 7 estate vineyards spread across 4 different AVA’s within the Pacific Northwest. Our winemaking goal is to try and capture the unique aspect of each vineyard site in order to produce wines that are both high quality and expressive. Our vineyards within the Rocks District of Milton-Freewater and the Walla Walla Valley provide world class fruit that is harvested at low yields in order to maximize flavor. Our Rattlesnake Hills and Columbia Valley properties, being in warmer climates, allow for larger scale production that is focused on our more value driven tiers. If you are interested in experiencing the Vineyards first hand please see our our winery and vineyard tour section of the “Visit Us” page for more information. All Watermill estate vineyards are LIVE Certified Sustainable and Salmon Safe. Watermill’s flagship property and the “jewel within the crow” of our vineyard holdings. 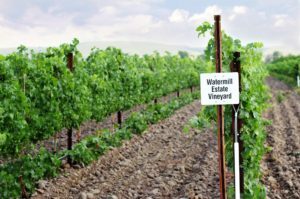 Watermill vineyard is our only property located within the Rocks District of Milton-Freewater AVA, this region is regarded as the best in the Walla Walla Valley and it consistently outscores lesser Walla Walla Valley appellation wines. The Rocks District AVA was viewed as unworkable due to the presence of large cobblestones covering the ground that are remnants of the former riverbed that once covered the southern portion of the Walla Walla Valley floor. However, in 1997 pioneering French winemaker Christophe Baron planted the first vineyard for his winery, Cayuse, in the Rocks District in 1997. Following in this pioneering spirit, Watermill planted its vineyard in the Rocks AVA in 2006 and produced its first Rocks-District appellated wine in 2008. The Watermill Vineyard continues to play a vital role in making Watermill’s Rocks District Estate Wines. Please visit the Rocks District Winegrowers Association for more information. The McClellan vineyard is a traditional site that is nestled between the Seven Hills West and Cougar Crest Estate Vineyards in Southeastern corner of the Walla Walla Valley. Located at the crux of where the valley floor meets the gentle rolling hills of the Palouse, the shallow silt loam soils and low elevation are well suited to producing fruit forward and complex Bordeaux varietals. 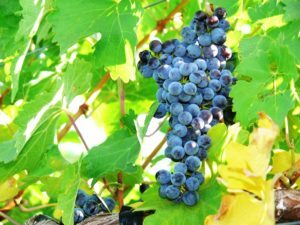 Grapes from these vineyards, grown on a Geneva Double-cross training system, have produced unmatched wines, including those of critically acclaimed Saviah Cellars and Seven Hills Winery. McClellan vineyard, along with the Duggar Creek Vineyard are the primary blending components in Watermills Walla Walla Valley appellated wines. The second half of Watermill’s blending vineyards and the Brown family's newest vineyard planted in 2009. Dugger Creek is located a stones throw from the McClellan Estate Vineyard, due west of the Cougar Crest Vineyard. A blend of the silt loam from the foothills and cobblestone from the valley floor, Dugger Creek provides a fertile growing location for not only the Bordeaux varietals that are found in the foothills of the Walla Walla Valley, but also the Rhone varietals that are more often associated with the Rocks District AVA. Dugger Creek also pushes the boundaries of experimentation with small plantings of Nebbiolo, Sangiovese, Barbera, and Grenache. The Brown family's original vineyard in the Walla Walla Valley, the Anna Marie vineyard is Watermill’s premier Bordeaux producing vineyard. Planted high in the foothills of the Blue Mountains in the south end of the Walla Walla Valley. The sandy loam soil, together with hot days and cool fall nights, results in superlative terroir allowing the production of premier red grapes, which have been utilized by prestigious vintners across the Walla Walla Valley, including Chateau Ste. Michelle’s North Star Winery. All traditional Bordaux varietals are grown here utilizing wide spaced rows that are trained to a single cordon, spur-pruned, vertical shoot position. Anna Marie produces the fruit for all Watermill’s single vineyard Walla Walla Valley wines. 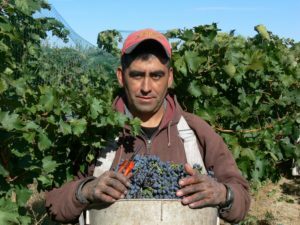 Owned by the Foreman family, Reyna vineyard is one of two key sources for fruit outside of the Walla Walla Valley. Located high above the banks of the Columbia River on the rim of the Columbia Plateau between Wenatchee and Quincy Washington, the topography and climate is well suited to producing traditional style Columbia Valley wines. In addition to supplying most of the white wine for Watermill’s wines, Reyna also provides the majority of Columbia Valley fruit for Watermill’s Chances R line of Value driven wines. Another property owned by the Foreman family, Windy Point vineyard is located at the convergence of the Yakima and Columbia Valleys in the Rattlesnake Hills AVA. 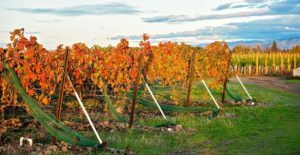 Windy point vineyard is a gentle hillside slope of medium elevation, that is well known for producing some of the state's best warm weather wines. The ashen and silica based soils left over as a result of volcanic activity and the receding ice shelf allow for maximum drainage of water. Ample sunlight and warmth results in full bodied, flavorful wines that are ready to drink now. 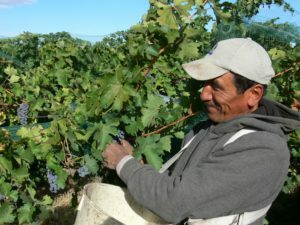 Once a popular winery in its own right, Windy Point sold to the Foreman family in 2017, and along with Reyna supplies the fruit for Watermill’s Chances R wines and a select number of member only wines. A partnership between the Foreman and Porter families, Keystone vineyard is located at the far north end of the Columbia Valley on the banks of the Entiat River between Wenatchee and Chelan. Once home to apple and cherry orchards, Keystone Vineyard, a cooler weather site then many of its counterparts further south, produces predominantly white wines and some red wines with distinct cooler climate flavor. Presently Watermill has done some small producing on behalf of Keystone but does not include the fruit in any of their wines. The newest vineyard in the Watermill’s portfolio, Waterstone marks the first co-venture by the Brown and Foreman families following their formalized partnership. 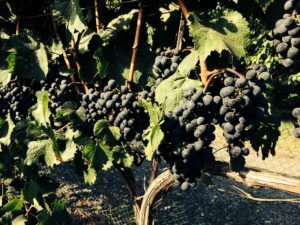 Waterstone is a small but productive vineyard in the Rocks District of Milton-Freewater that will start providing viable fruit with the 2019 vintage. Waterstone also allows for further experimentation on varietals within the Rocks District, with Cabernet Sauvignon and Viognier being planted for the first time.